There are two primary types of retirement savings vehicles: employee sponsored DC plans (such as 401(k) plans) and IRAs. For both types, benefits accrue in the form of account balances, which grow from contributions made by workers and investment returns. Examples of employer-sponsored DC plans make it possible for employers to offer payroll deductions and to make employer contributions to employee accounts. Individuals can save for retirement through IRAs, which allow individuals to make contributions for retirement without participating in an employment-sponsored plan. Workers and employers who contribute to retirement savings accounts generally receive favorable federal tax treatment, such as tax deductions for contributions and tax-deferred or even tax-free returns on investment. DC plans and IRAs provide tax advantages, portability of savings, and transparency of known account balances. However, they also place the primary responsibility on individuals to participate in such plans as well as to contribute to, and manage their accounts throughout their working careers, and to manage their savings throughout retirement in order to keep from running out of money. While the vast majority of IRAs are individual accounts, the Internal Revenue Code also provides for “individual retirement annuities,” which are annuity or endowment contracts issued by insurance companies and meeting certain requirements. These tax preferences are one of the largest implicit deductions for the federal government. Employment-based retirement plan coverage, especially in the private sector, has shifted from DB to DC plans. According to the Department of Labor, as of 2012 private sector DB plans had almost 40 million participants, while DC plans had about 91 million. According to Federal Reserve data, as of the third quarter of 2014, DB plans held about $11.2 trillion in assets, IRA assets totaled about $7.3 trillion and DC assets accounted for about $6.2 trillion. 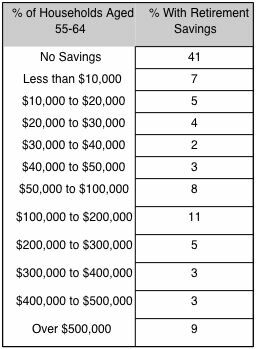 Rollovers from 401(k) plans and other employment-sponsored plans are the predominant source of contributions to IRAs. The total net retirement assets of the U.S. $124 trillion are then 20% of the total the nation’s wealth. We find that 70% of households that should be getting prepared for incipient retirement in fact are not ready. At the critical pre-retirement age of 55 to 64 more than half of the U.S. population has accumulated less than $100,000, which would yield only subsistence income of less than $417/month that would quickly decline further under the impact of inflation. The accumulation of investments for the purpose of creating retirement savings ranks on the top of a senior’s priorities, exceeded only by the need to preserve good health. Attention to the preservation as well counter-inflationary growth will therefore deserve a disproportional share of a retiree’s time. The critical time devoted to retirement savings is from the age of 40 to 65, when accumulations take place, and not onwards from the age of 65 where most retirees have usually only limited means to make changes in the financial circumstances.